Introductory note: The cards in the Global Series decks are generally not legal for Standard play, but they are legal for Standard if you are in China, as this product was designed for Chinese audiences. Any of the cards from this mini-set will thus have two Constructed grades from me: one for Standard and one for Legacy/Vintage. 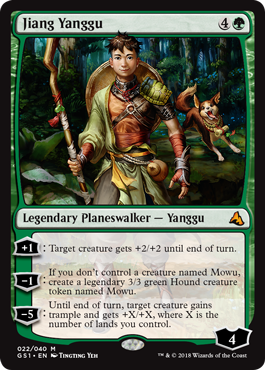 Jiang Yanggu is the first of our cover planeswalkers, and he’s a pretty “normal” green, creature-inclined planeswalker. Notable is that he can ult on the second turn he’s on the board, since his ult is at -5 and he comes in at 4 loyalty. So how does he fare? He’s…okay. Let’s start with his -1: you get Mowu, a 3/3 creature to defend Jiang while he ticks up if you have no board. That you are guaranteed a Mowu if you don’t have one is nice, and being able to get one through four turns helps Jiang create space to protect himself. It also gives you a creature to use his +1 with; swinging with a 5/5 is pretty okay, from personal experience. His ultimate loads up one creature and sends them in for a big swing; presuming no other shenanigans, the creature is at least coming in with +5/+5 and trample, a good way to try to end the game! Being able to threaten his ult immediately is a good way to apply pressure, as oft is the case. As a five-mana planeswalker, though, Jiang Yanggu is a bit weak overall. If he cost even just four mana, he’d be a lot more effective; that said, getting him out as early as turn 3 can help. He’s hopeless in Legacy/Vintage, since buffing creatures and making a singular 3/3 is nowhere near broken enough to see play, but he’s just fine outside of those formats. Jiang Yanggu clearly is intended to be used in the same vein as Garruk Wildspeaker, the very first green planeswalker. There is even a curious parallel between their abilities: a minus ability that makes 3/3 tokens; an ultimate that is Overrun, either literally or figuratively. The differences, though, make Yanggu an interesting choice in himself. For one thing, his Mowu token is legendary, and thus plays well with anything that cares about that, whether that be the Kamigawa block or Dominaria‘s legendary sorceries. While it only affects one creature, the fact that his Overrun-mimicking ultimate counts the number of lands you control means that it plays well with abilities like landfall and even ascend from Rivals of Ixalan. I don’t think that will be quite enough to push him into the top tier of planeswalkers, especially in the larger competitive formats, but he brings some potential to the table in Standard. Next articleHex Maniac – Pokemon New Ban List Week!